Turning is a slightly different process compared to CNC milling. CNC turning relies upon computer-controlled machines, but creates a different end product. The process uses a single-point cutting tool that is inserted parallel to the material that will be cut. The material ( metal, plastic, etc.) is rotated at varying speeds and the cutting tool traverses the 2 axis of motion to produce cylindrical cuts with exact depths and diameters. CNC turning can be used on the outside of material to create a tubular shape, such as a decorative brass shoulder bolt or nautical drive shaft, or it can be used on the inside of material to create a tubular cavity within the chosen material. 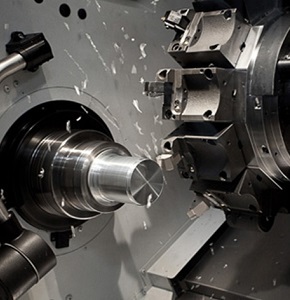 Just like CNC milling, CNC turning is now an automated process because it can complete projects faster and with greater accuracy than turning a lathe by hand. As mentioned, CNC turning is used to create objects with round or tubular shapes that are created from larger pieces of material. A drive shaft is a simple example of an object that could be created using CNC turning. Other examples include tubing and custom couplings for plumbing or other applications. If you are in need of CNC Turning and CNC Machining Service in the Atlanta, GA area, call Coweta Tech Precision. We have been providing quality CNC Machining and CNC Turning services in the Atlanta area for decades. Our team is ready and qualified to assist you with all of your CNC Turning needs.